Either search for ‘Garvald’ or Reference Numbers 18/00679/P and 18/00680. This entry was posted in Announcements, Broadband, Community Council on July 23, 2018 by Admin. The minutes from the June 2016 meeting of Garvald and Morham Community Council are now available on the GMCC page. Among the items discussed were the repairs to the bank of the Papana Water, the Garvald Woodland Project (phase 2) and the Haddington and Lammermuir Local Area Partnership. This entry was posted in Broadband, Community Council on July 1, 2016 by Admin. If you’d like better broadband, please complete the online survey at https://eastlothianconsultations.co.uk/policy-partnerships/community-broadband (scroll down to the bottom of the page and click ‘Online Survey’). “Haddington and Lammermuir Area Partnership are ready to begin formally establishing evidence of demand and interest across rural and remote communities through this area-wide survey. The survey will remain open until the 20th February 2015. 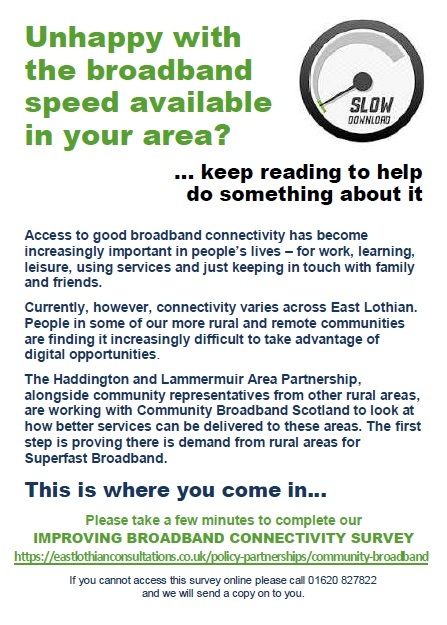 Garvald is included in the list of areas that are unlikely to benefit from existing plans to roll out Superfast Broadband, and the council needs your help to gather as many responses as possible in order to look at alternative ways of improving broadband in the rural areas affected. This entry was posted in Broadband, Community Council on February 6, 2015 by Admin.